More certificates of entitlement (COEs) will be available for the next three-month quota period starting from August - a development that motor industry players say will keep premiums stable. The Land Transport Authority said in its latest quarterly announcement yesterday that there will be 9,225 COEs a month from August to October - up 12.5 per cent from the present monthly supply of 8,202. Car buyers will have 6,912 COEs a month, or 5.7 per cent more than now. The number includes Open COEs, which can be used for any vehicle type except motorcycles, but are usually used for cars. 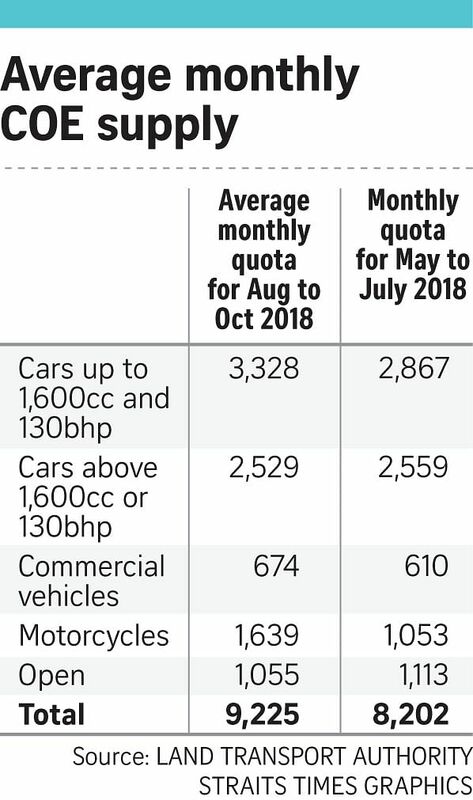 Motorcyclists will get the biggest increase, with their quota ballooning to 1,639 COEs per month - 55.7 per cent more than now. Mr Ron Lim, head of sales and marketing at Nissan agent Tan Chong Motor, attributes the rise in car COE supply to more cars being deregistered. Mr Lim said: "It's actually the early scrappage of newer cars, which led to the quota growth." These cars are those registered between 2012 and 2016, when car premiums were as high as $90,000. Now that premiums have plummeted to as low as $25,000, owners of these "high COE cars" are scrapping them because their annual depreciation is much higher than new cars now. "If we went by just the cars reaching 10 years of age, the supply should actually be flat," Mr Lim noted, saying it was the premature scrappage that raised the numbers. Singapore Motor Cycle Trade Association general secretary Norman Lee said the sharp rise in motorbike COE supply is fuelled by a surge in bike deregistrations. The outcome follows a recent government push to encourage riders to get rid of their older, more pollutive motorbikes. In the April-June period, 31,073 vehicles were deregistered, up 45.4 per cent from the previous three months. Motor industry watchers expect the expanded supply - which extends also to commercial vehicles - to further dampen premiums, which are at their lowest in almost 10 years for cars. In the latest bidding exercise on July 4, the premium for cars of up to 1,600cc and 130bhp fell by 26.7 per cent to $25,000. The COE price for cars above 1,600cc or 130bhp dropped by 8.6 per cent to $31,000. Tan Chong's Mr Lim said: "Hopefully, it will balance off the strong orders taken over the weekend." Bookings for new cars had surged following the COE plunge, a change that has prompted car dealers to anticipate a rebound in premiums. Mr Lim said he hopes premiums would not shoot up by too much. "Customers are still very watchful of prices," he said, adding that they will stay away again if price hikes were too sharp.